And after this election, we all deserve at least one (dozen). Whether you’re celebrating tonight, or looking for a balm for the soul, these moist, fluffy, absolutely delicious cupcakes are just what the spin-doctor ordered. Recipe adapted from my DASH Diet 30-Minute Cookbook; almond + vanilla extracts make this batter even better for election-night (nail) biting. ENJOY! Preheat oven to 350 degrees. Line a standard 12-muffin tin with paper liners and set aside. Measure the flour/s, sugar, and baking powder into a mixing bowl and whisk well to combine. Add the remaining batter ingredients to the bowl and stir just until combined. Divide the batter evenly between the muffin cups. Place pan on middle rack in oven and bake 18 minutes. Remove cupcakes from oven and place on a wire rack to cool. Measure the frosting ingredients into a clean mixing bowl and beat until fluffy. Once cool, frost the cupcakes. Decorate as desired. Serve immediately or cover until ready to serve. 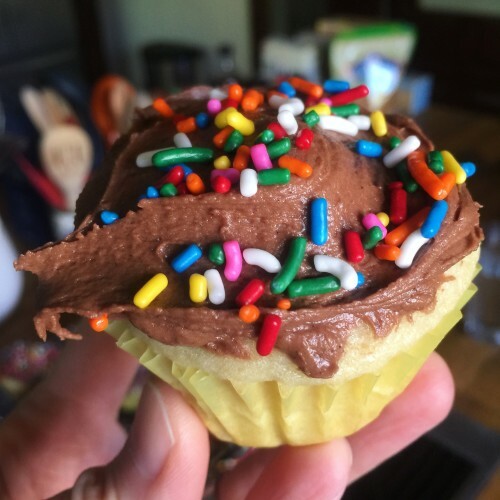 This entry was posted in Dessert and tagged The DASH Diet 30-Minute Cookbook. Bookmark the permalink.